The iComfort Hybrid is built to deliver the ultimate in comfort, support and temperature regulation. 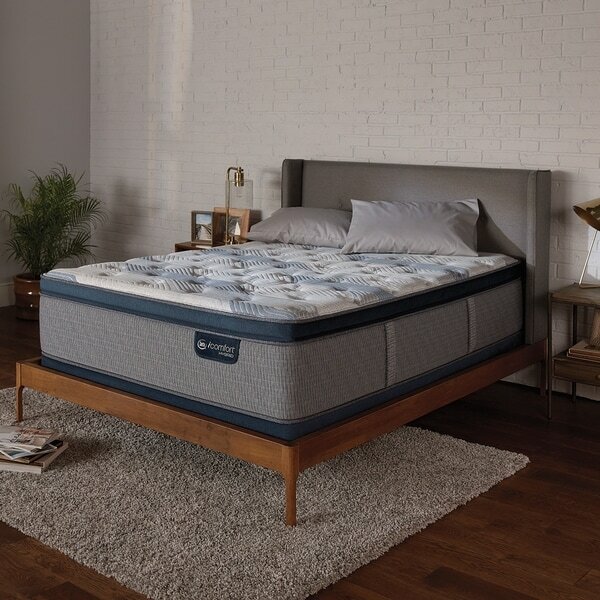 The Blue Fusion 300 combines 5 layers of hybrid coils and specialty foams to provide enhanced airflow and pressure relieving comfort. Please note: Options of excessive weight or bulk will be shipped via Freight carrier and our Oversized Item Delivery/Return policy will apply. Please click here for more information. White Glove Mattress deliveries require a 4-hour window to complete delivery; this includes carrying the mattress inside, unpacking it, simple set-up in the designated room, and removal of packing materials. Please check here for our most up-to-date White Glove information. Delivered by freight carrier. See Oversized Item Delivery Policy. This item will be shipped via freight carrier to your home, excluding rural routes, remote areas not in close proximity to areas commonly serviced by freight carriers, islands, APO/FPO addresses, P.O. Boxes, Alaska and Hawaii. Please provide your daytime and evening phone numbers during check out so our carrier can contact you to schedule delivery. Refer to our Oversized Item Delivery Policy for additional information.